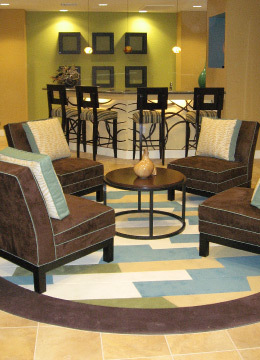 A customized Masland area rug can become the perfect compliment to a room. We also carry area rugs from Shaw including the Tommy Bahama line. From simple bound carpets or berbers to intricate floral patterns with custom colors, Classic Carpet & Flooring can create the perfect accent for any interior with any carpet available in the store. Choose from a variety of patterns, modify an existing design or develop a custom look of your own. Use a unique blend of colors and textures for a truly distinctive look. Additionally, we can provide area rugs from several manufacturers’ stock of custom collections, offering enduring quality and exceptional value. The Masland Area Rug Collection offers enduring quality and exceptional value, allowing you to add your personal signature with complete confidence. Choose from 120 colors, and choose field and border colors to match your decor. Or, choose from more than 300 patterns insert your favorite colors. If you don’t find a style you like you can use the patterns as a starting point to create something entirely new. Masland’s extensive custom capabilities make virtually everything possible. Add your personal signature to any room with complete confidence with an area rug that you’ve designed yourself.